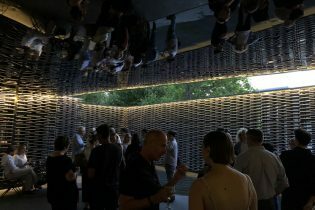 On Tuesday night, the Stage One team entertained some 180 guests at an evening reception at the 2018 Serpentine Pavilion, designed this year by Mexican architect, Frida Escobedo. On one of the warmest evenings of the year so far, this cool and airy pavilion provided the ideal setting to catch up with our friends and clients. From architects to theatre producers, event agencies to designers; the evening was a great success, new introductions made and stories of projects and work life shared. Thank you to everyone who braved the heat to attend! The design of Frida Escobedo’s pavilion has turned out to be particularly apt this year, the latticed ‘celosia’ walls providing shade while allowing light and breeze to filter through. Find out more about how we made the 2018 pavilion. 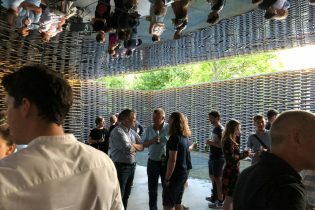 This is our 10th year manufacturing and installing the Serpentine Gallery’s summer pavilions and we’re incredibly proud of each one of these unique and diverse structures. Get the inside story from Ted, Tiff and the rest of our Serpentine Team in our ’10 years of Making’ video.